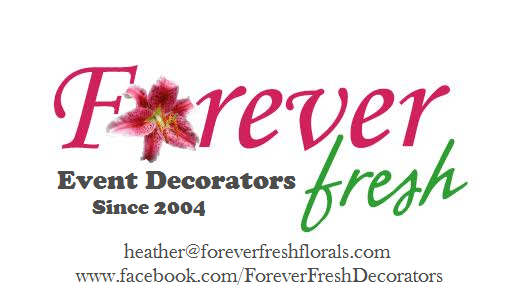 My name is Heather Lang, owner of Forever Fresh and I want to give you a little insight on how my company is run. I am proud to say the Forever Fresh is Wedding Wire approved, we were Wedding Wire rated in 2012 and 2013 plus Forever Fresh was awarded the Couple's Choice award on Wedding Wire in 2014. Providing breath-taking custom centerpieces since 2004 for any small & intimate or lavish & fabulous event we are always adding to our inventory to keep things new, fresh and modern for our clients. Along with our modern & chic inventory, we are also one of the very few decorators that also offers up lighting. Please make sure to check out our packages that are created with our clients' in mind. Keep in mind we customize each & every event that we do to fit your style. Being one of the area's top cutting edge wedding decorators we also offer a wedding planner, coordinator, decorator & an artificial florist to assist you on your special day. Our custom made flower arrangements are made with only the finest quality artificial flowers which are a great keepsake for the bride's bouquet, the bridal party bouquets', corsages, boutiners, altar arrangements & so much more. We are a family operated business and specialize in creating one-of-a-kind events in the Bismarck, Mandan, and surrounding areas of North Dakota specializing in modern, simple, elegant decorations to help transform any venue. If you are looking for a wedding decorator that keeps up with all the new trends,ideas, & is always striving to learn, look no further. We know that you will love what you see!